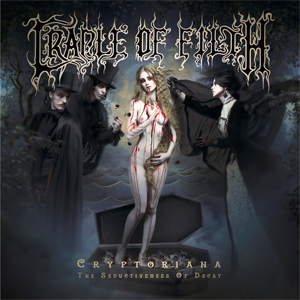 UK's legendary extreme metal icons CRADLE OF FILTH have announced the details for the band's upcoming 12th full-length album. Cryptoriana - The Seductiveness Of Decay will be released on September 22nd via Nuclear Blast. You can view the stunning cover artwork by Artûrs Bçrziòð below. Bçrziòð is the mastermind behind the new record’s artwork, photography and videography – best known for his defiant neo-symbolism raster graphics and oil paintings; postmodern interpretations of classic myths. He has been proclaimed as a “sacred monster of Latvian postmodernism”. "The album is deeply infused with Victorian gothic horror and thus the title is a reflection of that. Cryptoriana implies the Victorian's infatuation with the supernatural, the grave and the ghoulish. And the subtitle The Seductiveness Of Decay further cements this attraction to death and the glittering lengthy process of self-annihilation."